Synthetic peptide within Human Glucose Transporter GLUT1 aa 450 to the C-terminus (C terminal). The exact sequence is proprietary. HepG2 cells, esophagous and breast carcinoma. Our Abpromise guarantee covers the use of ab15309 in the following tested applications. ICC/IF Use at an assay dependent concentration. See Abreview. WB Use a concentration of 0.5 µg/ml. Predicted molecular weight: 55 kDa. The band may look broad like that for most membrane glycoproteins. A reviewer of another antibody against Glut1, ab652, suggests "do not boil sample before loading as this causes smearing of GLUT-1 bands". ab15309 staining Glucose Transporter GLUT1 (green) in Human red blood cells tissue sections by Immunohistochemistry (IHC-P - paraformaldehyde-fixed, paraffin-embedded sections). Tissue was fixed with formaldehyde and blocked with 1% BSA for 30 minutes at room temperature; antigen retrieval was by heat mediation in a citrate buffer, pH 6.0. Samples were incubated with primary antibody (1/500 in PBS-T + 1% PBS) for 12 hours. An Alexa Fluor® 488-conjugated Donkey anti-rabbit IgG polyclonal (1/500) was used as the secondary antibody. 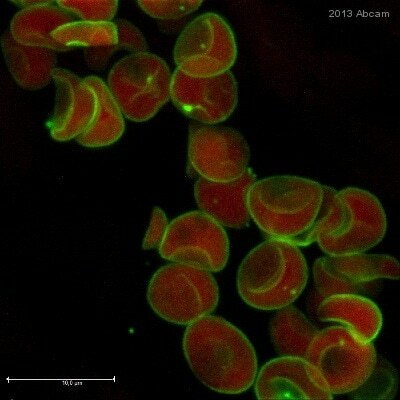 Red - autofluorescence of erythrocytes. ab15309 staining Glucose Transporter GLUT1 in human esophagous by Immunohistochemistry (FFPE-sections). ab15309 at a 1/100 dilution staining rat cells (neural stem cells from adult subventricular zone) by Immunocytochemistry/Immunofluorescence. The cells were incubated with the antibody for 18 hours and then bound antibody was detected using a Cy3 conjugated Goat anti-rabbit IgG (H + L). This image is courtesy of an Abreview submitted by Martin Maurer. ab15309 at 1/300 dilution staining GLUT1 in human fetal heart by immunohistochemistry (frozen sections). Sections were paraformaldehyde fixed, permeabilized in saponin 0.1% in PBS prior to blocking in 10% serum for 45 minutes at 37°C and then incubated with ab15309 for 1 hour at 37°C. 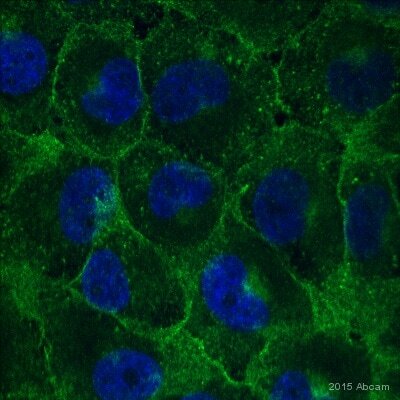 Alexa fluor® 488 goat polyclonal to rabbit Ig, diluted 1/600, was used as the secondary antibody. 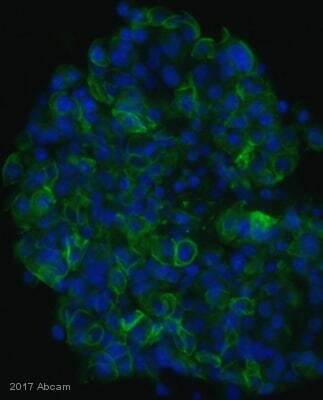 ICC/IF image of ab15309 stained HepG2 cells. The cells were 100% methanol fixed (5 min) and then incubated in 1%BSA / 10% normal goat serum / 0.3M glycine in 0.1% PBS-Tween for 1h to permeabilise the cells and block non-specific protein-protein interactions. The cells were then incubated with the antibody (ab15309, 1µg/ml) overnight at +4°C. The secondary antibody (green) was DyLight® 488 goat anti-rabbit IgG - H&L, pre-adsorbed (ab96899) used at a 1/250 dilution for 1h. Alexa Fluor® 594 WGA was used to label plasma membranes (red) at a 1/200 dilution for 1h. DAPI was used to stain the cell nuclei (blue) at a concentration of 1.43µM. Publishing research using ab15309? Please let us know so that we can cite the reference in this datasheet. 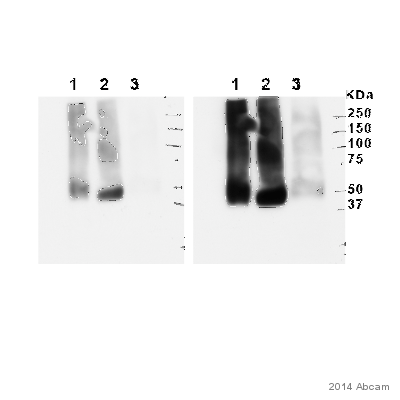 Dear customer service staffs, I looked at the Western blot image on your web site for ab15309 antibody at the following link. https://www.abcam.com/index.html?datasheet=15309&tab=abreviews∫abreviewid=26667 According to many papers, molecular weight of GLUT1 should be 45kDa or 55kDa. However, the image suggests that ab15309 antibody detects only 75kDa band. Does it really detect GLUT1 or something else? If you have any papers explaining this 75kDa band, please let me know. 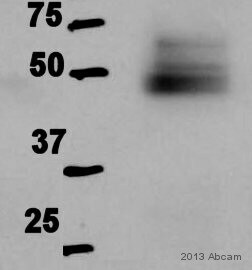 Inquiry: Dear customer service staffs, I looked at the Western blot image on your web site for ab15309 antibody at the following link. https://www.abcam.com/index.html?datasheet=15309&tab=abreviews&intabreviewid=26667 According to many papers, molecular weight of GLUT1 should be 45kDa or 55kDa. However, the image suggests that ab15309 antibody detects only 75kDa band. Does it really detect GLUT1 or something else? If you have any papers to explain this 75kDa band, please let me know. The two images for WB on the datasheet are under the Abreviews section, so they are results that customers have provided us and not references. One of these reviews does report the band at the "expcetd" 58 kD, while the other does show a higher band around 75 kD. Although I cannot say for sure why this band runs higher than the predicted molecular weight, post-translational modifications such as phosphorylation and glycosylation can cause this. Bands on a WB may also run up to 10 kD differently depending on the gel, buffer type, etc. How many times have you tried the Western? I appreciate the time you have spent in the laboratory and understand your concerns. It is regrettable the results have not been succesful. Reviewing the details, I am sorry there are no further tips to provide on this occasion to help improve the results. I can suggest you have regrettably recieved a bad vial. I apologise for the inconvenience and am pleased to offer you a free of charge replacement or credit note in compensation.